The 16-bit Super Famicom was an impressive system when it was released, outstripping the graphic and sound capabilities of its competition. Throughout its long life, the Super Famicom featured a small number of accessories and peripherals compared to many other Nintendo systems. While some, such as the Super Scope and Satellaview, only received moderate popularity, others, such as the Super Game Boy and SNES Mouse, were much more successful. Super Famicom hardware uses serial code SHVC (Super Home Video Computer), while the U.S. SNES hardware uses serial code SNS (Super Nintendo System). In PAL regions (Europe, Australia), the serial code SNSP (Super Nintendo System PAL) is used. Despite the different codes, the model numbers for hardware components are shared across the different regions. The Super Famicom, released in 1990 in Japan, was designed by Masayuki Uemura, the designer of the Famicom. The system was redesigned for its U.S. release, featuring more sharp angles and a dominant purple colour design. The PAL version of the SNES kept the curves and colour scheme of the Japanese system. Released 2-3 years after its 16-bit competition the Sega Genesis and NEC TurbografX-16, the Super Famicom featured enhanced graphics and sound capabilities. Its biggest feature at launch was Mode 7, a graphical technique that allowed a flat graphic to be scaled and viewed in various scrolling 3D perspectives. 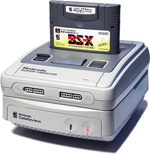 The system featured 2 controller ports and an expansion port that would be used for the Satellaview add-on, as well as for a planned but never released CD expansion. A satellite modem system, released only in Japan in 1995. The Satellaview receieved scrambled signals during "Super Famicom Hour" from the satellite radio company St. GIGA, to which users would have to pay a subscription fee. The scrambled signals were decoded as digital magazines and games that could be saved to a Memory Pak. Some games provided a competitive element, sending score or time data back to Nintendo. Special "Soundlink" games were often played exclusively during certain broadcast hours, often leading to competitive play. These broadcasts would typically feature actors whose voices would be broadcast during the game. Super Famicom Jr. / SNES Jr.
A redesigned version of the Super Famicom and SNES was released in 1997 in the U.S. and 1998 in Japan. The system was never released in PAL territories. The system was much smaller than the standard system, and featured a much less complicated button layout. Due to the size limitations, a number of other accessories are not compatible. The U.S. release featured the exact same shape and layout of the Japanese system, but the colour scheme was changed to the purples of the original model SNES. The controller released with the system features its own model number, but it was essentially identical to the original SNES controller. SHVC-101 Super Famicom Jr. / SNES Jr. The Super Famicom & SNES controller was more rounded than the Famicom and NES controllers, providing for a more comfortable grip. Movement input was still through a digital + Directional Pad, while other inputs were through four coloured face buttons (A, B, X, Y), a Start and Select button, and two shoulder buttons (L, R). 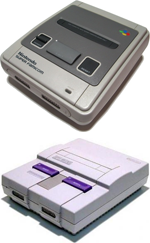 In the U.S., the face buttons were recoloured purple, in-keeping with the design of the SNES. 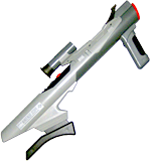 A large, wireless, shoulder mounted light gun that registered hits by reading scanline information from CRT television sets and feeding the hit/miss data to an infra-red sensor positioned on top of the TV set. Because it uses this method, the Super Scope will not function on many modern LCD or plasma TV sets. The Super Scope required 6 AA batteries, but had a short battery life. In PAL regions, the Super Scope was simply called the "Nintendo Scope". A computer-style 2-button mouse for the Super Famicom & SNES. Many popular 16-bit games were designed for home computers, and many would not port comfortably to the Control Pad. The Mouse and Mouse Pad came packaged with Mario Paint. The Mouse was compatible with dozens of games, many of them ports of PC puzzle or strategy games. Nintendo themselves produced a small number of games compatible with the device. Only available in PAL regions, the Score Master arcade-style controller was designed to play games such as Street Fighter II using a more authentic interface. The controller featured a large joystick in place of the + Directional Pad, and six large buttons on the front, with the L and R shoulder buttons relocated on either side of the X button. A number of similar, third-party arcade controllers were available in other territories. The Super Game Boy game pak, released in 1994, allowed original Game Boy cartridges to be played through a Super Famicom or SNES on the TV. Classic Game Boy cartridges and black Game Boy Color cartridges work in the system (running in classic Game Boy rather than Color mode), but Game Boy Color exclusive games do not work in the device. Because Game Boy games output at a lower resolution than a TV screen, the Super Game Boy provided a number of border designs that would display around the edge of the game area. It was also possible for the player to design their own borders using a Mario Paint style interface. Nearly all Game Boy games released after 1994 featured their own Super Game Boy borders and special colour palettes, while a number of titles also contained enhanced sound and other special features. In 1998, Nintendo released the Super Game Boy 2 in Japan, which featured a link cable port and LEDs showing power and game link. It also featured a number of exclusive borders, replacing those found in the original Super Game Boy.